Kelly Talim appeared on Show 246, recorded in February 2012, at age 16. 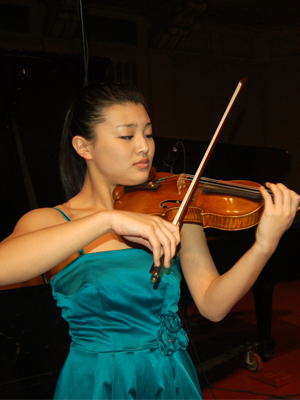 Kelly Talim (violin), age 16, comes from Buffalo Grove, Illinois. She attends the Adlai E. Stevenson Public School in Lincolnshire, Illinois and studies violin with Cyrus Forough. Kelly is a member of the string quartet “Poco Fuoco” and the Music Institute of Chicago’s chamber orchestra. She has also been involved in the Great Mountains Music Festival & School and the Bowdoin International Music Festival, and she was the winner of the 2011 Blount-Slawson Young Artists Competition. Kelly claims that the strangest thing about her is that on schooldays she tends to be a different person in the mornings than at night.